Isn’t It Romantic (the title is sans question mark) has a series of interludes that immediately date the piece, and which at first seemed somewhat cloying: During several scene changes, Janie’s answering machine — Remember those? So novel 35 years ago! — plays messages left by her parents, Vladimir, a potential employer and Cynthia, a hapless wannabe friend of Jane’s. (To be fair to Wasserstein, who died in 2006 at age 55, this device was likely something she put to paper before it became cliché.) Fortunately, the playwright backs away from some of the obvious jokes in these messages, which aren’t as grating as they initially threatened to become. The Cary Players have assembled a wonderful array of costumes that ground the play in its time by showing off some of the awful fashion trends of the eighties. There’s at least one instance of what until very recently one might have called a Cosby sweater, and we get some of the oversized shoulder pads and exaggerated lapels that were au courant in the business world at one time. (At least, that’s how I remember it thanks to Hollywood and TV.) Tasha aerobicizes in the play’s opening scene, provoking a horrified reaction from her daughter thanks to both her activity and her outfit. And Harriet sports a big, boisterous hairstyle that absolutely screamed 1980s! to me. 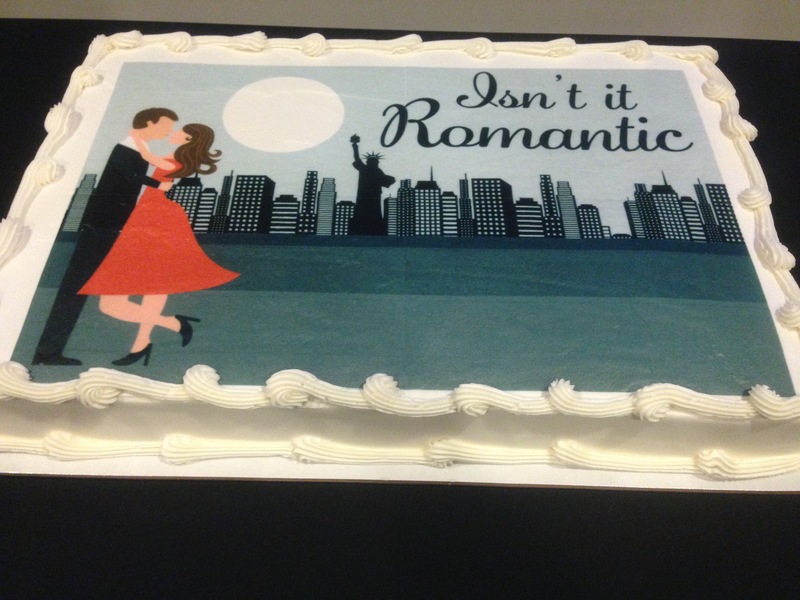 Isn’t It Romantic is chockablock with Yiddish phrases and references that many people not from the greater New York area might miss. Janie seems to conceive of the city’s surrounding communities in New Jersey and Long Island as horrifying cultural voids. I am, oh, let’s say a generation younger than Wasserstein, and I grew up outside of the city, not in it, but the play resonated for me in enjoyable ways. To assist those from other backgrounds, the Cary Players’ program includes a short glossary, although there were one or two references that even I missed. The audience — some of them longtime locals, some of them New York émigrés, some of them both — seemed to enjoy the production, laughing in the right places. 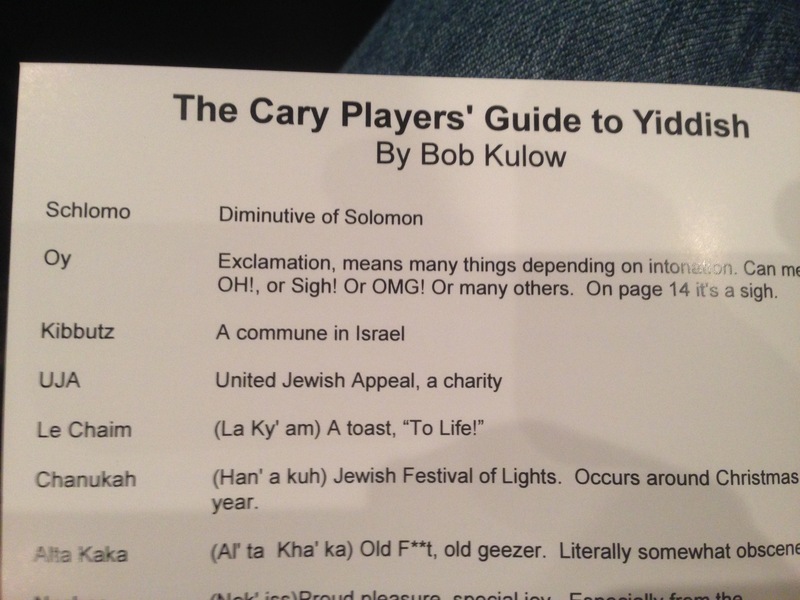 The program for the Cary Players production of “Isn’t It Romatic” by Wendy Wasserstein includes a guide to the Yiddish expressions and other language used by the characters. While it’s far less radical today than it would have been in 1981 for a woman to consider choosing career over family, the dilemmas faced by the woman who wants to have it all are much the same today as they were in 1981; so too with the challenges faced by young college graduates who are finally beginning to come into their own as full-fledged adults. The clothing, and even some of the humor, in Isn’t It Romantic may be dated, but its themes are quite relevant at this moment in the 21st century. The cast is uniformly excellent, although I must air two quibbles with the lead actress. She is not plump, as Janie was evidently intended to be, and she does not in the least bit seem to be Jewish. (Isn’t It Romantic is apparently semi-autobiographical — Wasserstein was Jewish and grew up in New York City, like Janie; her mother was also an avid dancer.) Still, she has an appealing presence. The play is being staged at the Cary Arts Center, which I’ve driven past numerous times but had never been inside prior to last Friday. The former school, built in 1938, is stately on the outside but has a vibrant, modern lobby thanks to what was evidently a major renovation that the town of Cary completed four years ago. One of the works on display there is a Dan Nelson painting of the building’s main entrance that will be auctioned off to benefit the town’s recreation scholarship fund. 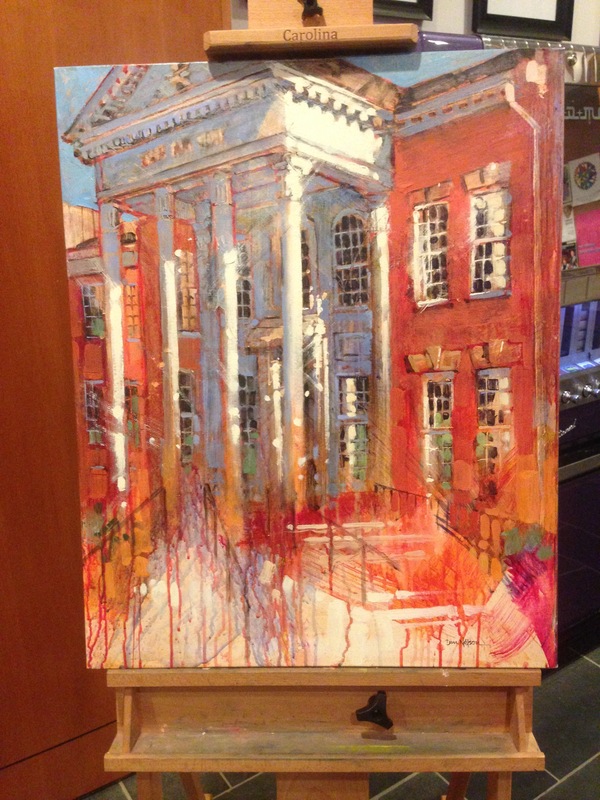 “Cary Arts Center” painted by Dan Nelson in May 2015. The artwork, which is currently on display in the lobby of the building it depicts, will be auctioned off to benefit a fund for recreational scholarships in the town of Cary, N.C.
Isn’t It Romantic will be performed at the Cary Arts Center on Sept. 25 and Oct. 2–3 at 7 p.m. and on Sept. 27 and Oct. 4 at 3 p.m. Tickets are available at this link. This entry was posted on	September 24, 2015 at 8:35 am	and is filed under Diary.